In general segments arise in analysis to answer the next question. If I have a measure of the total number of visitors to a site, the next question might be “Who of those visitors came for the very first time?” and of those first time visitors the next question could be “Where did those visitor come from or how did they hear about us?” To support these questions we have to separate new from returning visitors, maintain referring domain or introduction that indicates the marketing materials the visitor viewed. So how do we develop segments that potentially address every possible question that an analysis or decision maker might ask? One might be tempted to collect everything and get as much data as possible to cover every contingency. However there are ways of developing a semantic model for segments that not only focuses on the appropriate data to collect but also ensures that the data collected will actually support business questions and decisions. The technical term for semantic model is ontology. If you spent A Day Being Mark then you know that ontology defines the relationships among the concepts within the domain. Also that RDF (Resource Description Format) is one of the ways that ontologies can be described on the Semantic Web. That is somewhat beyond the scope of this article but I will return to this at end. Here we will define the node concepts and indicate potential relationships for exploration. What we need to do is map several different ontologies to align analytic measures with enterprise objectives and business processes. In part one, we covered the mechanics of mapping web analytic measures to latent (or hidden) behaviors that are not directly observable but are of most interest to a business, for example bounce rate. This requires at least an implicit understanding of where the business’ interests lie, such as all the reasons a visit would have one page-view. Here we will develop an explicit semantic model of the enterprise and how it operates within a competitive environment for customers. Then show how web analytics through segmentation analysis and customer experience management (advance analytics analysis) map to this model and support in-depth analysis of customer experience. At a high level – the model is very simple. The enterprise operates within a marketplace competing for customers and where it interacts directly with customers is called a site, which can be web site, a store, or a call center. The enterprise describes how the business organizes itself to provide services or products to a customer and includes the outbound marketing to reach those customers. The marketplace is a result of inbound marketing efforts to determine the competitive landscape and segments of customers that will be reached in the marketplace called persona. Finally the site is the physical manifestation of the business where the enterprise interacts with the customer. The discussion of this model can be found in Segments, Segments Everywhere where all the concepts are described in more depth. Here we will summarize those discussions using concept graphs the give the semantic definition of the elements. The Semantic Model of an Enterprise Operating within a Marketing Place. This is not a complete semantic model but is general enough to apply to most business models. Where a specific business may deviate from this model can be illuminating and give important clues to how the analytics will latter have to be tailored to the business. The essential elements that from which almost all analysis will map to are the objectives of the enterprise and how these drive the business process and decisions. An important aspect of this semantics is how the business views its customers and how it expects to engage and value customers throughout their interaction with the business. From this Customer Engagement Cycle are derived the business funnels that give the significant tasks and events in the life of a customer to meet business objectives. It will be these events that will have to be captured later in the analytics, and essentially all analytic measures will have to have some relationship to business objectives. The business including online and off-line (brick n mortar) resources. • Customer A person who is engaged with the business in the marketplace. The customer as a user of the business product or service. The customer phase transitions leading to accomplishment of business objectives or goals.Ideally each phase is captured as a transition event called a conversion. The relationship of each channel introduction to business funnel transitions.Not a true funnel but an indication of how channels present opportunities to move visitors through a funnel. • Business Process Management The primary processes that the enterprise must put in place to be successful as well as objectives for each process to ensure that the business is profitable. • Business Objectives The top-level business objectives that should measured and monitored. All measures and metrics should have some relationship to these objectives. Business performance metrics and objectives that must be measured and monitored and are sensitive to process optimization. • Marketing Outbound marketing message and materials for reaching prospects and converting them to customers in the competitive marketplace. • Campaign The specific marketing information placed into the channel by the enterprise. Typically marketing campaigns are multi-tactic and multi-channel attempting to coordinate the theme and message across all channels. When an ad is executed it will appear to the Analytics as an introduction via a tracking URL. The part of the creative that attempts to grab the viewer’s attention such as a title or subject line. The text content of the advertisement that communicates and motivates the call to action. The marketing task that the ad wants the viewer to initiate. • Tracking URL The landing URL with marketing parameters added to allow the Analytics to track and appropriately attribute to site actions. • Execution Order The details of the conditions established with the channel for the execution of the ad campaign on that channel. The times the ad will be broadcasted. Where the ad will display or be heard. Who will view the advertisement. A key element of the marketplace are the channels that can reach prospective customers. It is important to understand how marketing campaigns are related to channels. An important postulate of multi-channel marketing is that regardless of the tactic or physical channel, the semantics is exactly the same. That is not to say that they will not use different terms to describe the same thing, but with regards to tracking across channels the approach will be the same. The competitive market environment within which the enterprise must operate. Though a product from marketing research this should not be confused with marketing. • Social Persona Marketplace as perceived in the Social Media / Public where Ideas compete as well as message. • Marketing Persona The representative of a segment of customer that has specific needs and preferences for business services being offered. • User Scenarios Scenarios describing how the persona interacts within the market place highlighting roles and needs. • User Experience Persona The description of specific capabilities and experience of the user that can effect the design of the offering. • Use Cases Step by step breakdown of how the user of the product or service accomplishes the tasks identified in user scenarios. • Scrum Stories The further breakdown of a use case to a specific capability that can be implemented in a scrum cycle. • Channels How prospects in the marketplace can be reached and how visits are brought to the business site. • Audience The segments of prospective customers that a specific channel can reach that may be further broken down into marketing and user experience persona segments. • Demographics Grouping prospects by characteristics inherent to individual or house hold such as age, gender, education, profession, income, locale. • Techno graphics What technology must the prospect have to be reached via the channel such TV, Radio, Internet, Mobile, Widgets. • Behavioral What observed characteristics can be used to further qualify the visitor such as location, search phrase, visitor state. • Attitudinal What are attitudinal characteristics that can be considered such as intent, motivation, need. • Tactics The primary method facilitated by the channel for reaching prospects that typically effects the creative and workflow of marketing campaign directed to the channel such as display, search, affiliate, email, direct, promotion. Sometimes multi-channel means multi-tactic or channel further segmented by tactic. • Placement The location and context for ads placed before a prospect that affects coverage and reach metrics for viewers as well as visit intent when they come to the site or property. • External Marketing channels external to the site used to bring business/product awareness or engagement with the prospect. • Internal Marketing channels within a site that can further inform, motivate, and direct the visitor to the appropriate property and function. The following gives the definition of elements that make up a web site, however analogs can be found for any physical site, such as stores and call centers. So as an exercise one may want to give the analogous element for these other sites. For example, what would be the cookie and crumb analogs for tracking customers in a store or call center. The web site, call center, or store where the business interacts with the customer. • Map How the site manages the various properties that make up the site and how the visitor can locate and access properties upon entering the site. • Domains The designation of the site location. For physical sites this could be different locations. For web sites this can be different domains coming to the same site or same domain mapped to the nearest site for the visitors locale. • Sub domains How properties are identified relative to the site. For web sites these are typically sub domains of the primary domain in the URL. For a store these are departments, which can also be identified by a URI such as a URL. • Paths How sections within a property are identified and accessed. For example, in a department store this would identify the aisle down to the table, rack or shelve where a specific item is located. For a web site this would include all the parameters necessary to locate and configure specific content or function for the visitor. • Meta General information that all properties must provide including tracking parameters for analytic collection. • Cookies The method for identifying and tracking a visitor while at the site. Though a web term this is analogous to visually recognizing and tracking customers in a store, Ie the face is the cookie. • Crumbs Session state data collected during a visit to the site. For web sites crumbs typically aide in helping navigate the visitor through the site. • Visitor A customer or prospect engaged with a business on site. • Visit An opportunity to engage a customer while visiting the site. • Property A section or department within a site where visitor can perform various functions. • Function A specific task of a visitor that is facilitated by the property. • Content Any form of media (text, video, images, icons, graphics) that is presented to the Visitor as part of the function, though may not be directly related to the function. • Brand Content generated primarily to promote brand and overall business perception by visitors. • Marketing Content generated by marketing to motivate and communicate adoption of products and services. • Product Information specific to the execution of the function. • Technical Content generated to explain the technical aspects of the product or service including specifications, legal documents and policy guidelines and enforcement. • Web Flow Content and Action Sequence for the purpose of moving a visitor through the completion of a task or function. This can be also define as the intended workflow for a user of a function such as checkout. • Framework The site architecture primarily focused on the presentation and content management. These are referred to as the themes and motifs of the site as well as the layout of the various departments within a site. • Look & Feel The emotional aspects of the site that affects customer experience. • Component The component function and behavior sans the face that makes up a treatment. • Style The design elements the make up a treatment including the face of function components. • Branding The branding elements such as logos and iconography the define the brand and communicate at an emotional level the major message(s) of the business such trustworthy, innovative, stable, quality. • Navigation The aspect of customer experience focused on locating and searching for information and services. • Layout The architecture for allocating real-estate for property functions, navigation, marketing, and branding competing concerns. • Help How the customer will find help throughout the user experience. The analytic data that is collected consists of measures, normalized measures called metrics and dimensions. Any measure or metric can be a criteria for a visitor or site segment. Dimensions are also referred to as classifications usually are boolean, or discrete value sets that partition the visitors into groups. As was discussed in part 1, combinations of measures and segments are used to develop metrics that map to latent behaviors of actual customers. Each web analytic tool has different methods for setting up measures and dimensions and defining metrics and key performance indicators. Here we will use Omniture’s SiteCatalyst to demonstrate how this is done in part because it can be the most confusing yet most powerful framework. There are two general approaches to instrumentation and data collection. WebTrends, Google Analytics, Yahoo Analytics, and Omniture use front-end collection where all parameters must be inserted into the page typically by the presentation web server. Coremetrics and ClickTracks use back-end collection where information is extracted from the raw data by rules implemented by back-end processes. The primary distinction between these two approaches (that is relevant for this discussion) is that front-end collection stores visitor state in cookies and back-end collection keeps visitor state on the collection servers. Understanding this difference helps to understand how and why data is described or collected the way it is. For example, the first group by definition do not track visitors that have disabled cookies, while the second group can actually follow cookie disabled visits. With Omniture, the dimensions of a page are stored in parameters called s.props (for properties) that are collected but never attributed to a visitor or event. The dimensions of a visitor are set in s.eVar (for event variables) on a page and stored in the visitor state (cookie) sometimes replacing a previous value for the same eVar and other times incrementing a counter. Whenever an event is declared via a s.event variable within a page, the visitor’s eVars are attributed to the event and become its dimensions. If there are s.props that should also be set for the event, then these must be mapped to a s.eVar also to allow attribution. For example, referring domain is a page property stored as a predefined page parameter. It can also be an important event property so it needs to be copied over into an eVar. Marketing parameters collected from the tracking URL for a channel campaign are automatically collected and attributed as eVars. One of the features of backend collection is using instrumentation scripts to collect data within the browser’s document object model (DOM) including events handled within the browser. These events and data are collected as is and through backend rules converted into page and visitor parameters. GA and Omniture provide a similar capability. With Vista in Omniture and script modules in GA, the instrumentation script can be expanded to collect data on the client and insert values in tag parameters for collection. These scripts must perform both the collection and backend processing on the client. With these techniques in hand we now want to assign s.props and s.eVars, depending upon whether we are segmenting site or visitor behaviors. We also want to establish congruence between events (success events in Omniture) and transition events called conversions within a business funnel. There may be other events collected and attributed to eVars, but events associated with conversions should have a direct relationship to business goals at the end of the business funnel, and therefore have direct relevance to business objectives measured by KPIs and KSIs. The following diagrams maps the analytic semantics with the enterprise model semantics. The instrumentation, collection, processing, measurement and reporting of enterprise, marketplace, and site processes. • Visitor Profile The events and annotations that describe the visitors interactions with the business’ sites over multiple visits. The visitor attributes called the visitor state are measures derived from the accumulation of visits and actions complete during these visits. • Session Profile The visitor characteristics that have been collected during a specific visit. • Introductions The set of introductions (external referrals from marketing channels) encountered during a visit forming a time ordered stack for attribution to conversions within conversion funnels. • Conversions Transition events in visitors engagement with the business which are ordered within a business funnel. Also called success events that may not be necessarily related to funnel transitions. • Content Paths The specific content that was loaded during a session ordered by time of first download. This can be separated by main content, marketing message, or ads served. • Pages A set of content items that is downloaded and viewed as one treatment by the visitor. • Page Views The sequence that a visitor has viewed page content including returning to cached content. For dynamic content within a page, each change of sub content can be deemed a page view. • Ads The content of a specific advertisement. • Impressions The view of an advertisement by visitor analogous to a page view for topic content. • Clicks The visitor performing the call to action of an advertisement typically by clicking a call to action button for hyperlinked content but can include calling and coming to the site for traditional marketing content. • Voice Of Customer The collection of site survey data related to a visitor’s experience during a visit. • Satisfaction The set of survey questions that measure the customer’s satisfaction with the visit experience and whether the experience meets their expectations. • Drivers Of Satisfaction The elements the define the customer’s experience for which satisfaction is measured and weighted as part of the of the overall experience. • Session Task The set of survey questions that determine the specific task the visitor was attempting to perform while on site. • Congruent The customer task was the same as one of sites primary objectives with completion coinciding with conversions. • Supported Visitor task secondary to site objectives but supported such as using shopping cart and checkout to perform “what if” computations. • Unsupported Visitor task is not supported by the site and did not meet the customer’s objective for example expecting Voice of the Customer to be rock group and wanting to download some music. • Treatments The specific content and functions that a visitor has been exposed to typically over multiple visits. For MVT each variation in treatment is a separate test group and the visitor is ensured to get the same treatment for every visit during a test. • Targets Grouping by visitor profile characteristics that will share the same treatments during testing and for behavioral targeting. Targets must eventually map to marketing and user experience personas so that content generated for these is in sync with what can be targeted. Some of the regular readers may have noticed that this model incorporates the Analytic Ecosystem from the Eric Feinberg of ForeSee Results Interview where behavioral and attitudinal analytics have been combined to support a broader notion of Customer Experience Management (CEM). CEM here includes a number of different types of in-depth analysis that look at different aspects of the customer experience and how these are supported by the Enterprise and Analytic semantics. Here we give a partial list of the various forms of analysis that cover different parts of the graph. The advanced Analytics and Analysis for diagnosing and optimizing user satisfaction that requires appropriate application of segmentation. • Segmentation They are everywhere but different meanings in different disciplines. • Conversion Attribution How do marketing channels and visitor behavior contribute to conversions and business objectives. This would include any forms of cluster analysis to find optimal mapping of visitor characteristics to performance. • Business Funnel Management Tuning funnel metrics and managing funnel flow to optimize performance by bring more customers to high valued customer segments. • Performance Marketing Optimization Management of marketing campaigns to optimize performance relative to KPI metrics including SEM and SEO. • MVT Perform multivariate testing or adaptive processing that improves performance based upon varying treatments for various targeted characteristics. • Customer Segmentation Analysis Determine from the analysis of analytic data how customer are segmented and align these segments to marketing and user personas. • VoC Analysis Voice of Customer Analysis that processes the data collected from surveys combined with behavioral data to determine satisfaction and intent of the customer. • Task Completion Analysis Did the visitor complete the task they had when coming to the store or website? This results in task completion measures that can be further broken down by visitor segments. Do certain segments do better than others? • Econometric Predictive Analysis Construct a predictive model that weighs and maps drivers of satisfaction scores to business performance goals to predict how improvement in satisfaction effects business bottom-line. • Path Analysis Combining visitor profile (including both behavioral and attitudinal characteristics) with the actual content and treatments the visitor experienced to find characteristics of paths that lead to improved performance or diagnose potential problems that inhibit performance. This goes beyond what can be found in simple path and page entry and exit reports and includes session replay and algorithmic processing to find clusters and trends in the path data. • Presentation Optimization Optimizing layout and content to meet user satisfaction and monetization criteria including conversion rates. Segmentation analysis, which is core aspect of web analytic offerings provides a starting point for understanding user experience including multivariate testing (MVT), conversion attribution investigations. It supports business funnel management, performance marketing optimization, and customer segmentation analysis leading to marketing and user experience personas that can be related to visitor properties. Here personas are the latent segments that must be mapped by visitor properties to be observed. The twin process to the behavioral analytics is the attitudinal analytics derived from Voice of Customer surveys that can measure customer task completion, satisfaction, and net promoter measures of the customer experience. These measures related directly to both visit experience and completion followup surveys when combined with behavioral measures can lead to predictive analytic models of business performance. There is also the path analysis and visit replay capabilities normally associated with CEM that combine analytic behavioral and attitudinal data with the actual content to find patterns and correlations related to user experience. An important product of this analysis in optimization of the presentation for merchandising or publishing. For a more detailed discussion see Segments, Segments Everywhere that presents these terms in full sentences and examples. Here the general approach has been outlined. 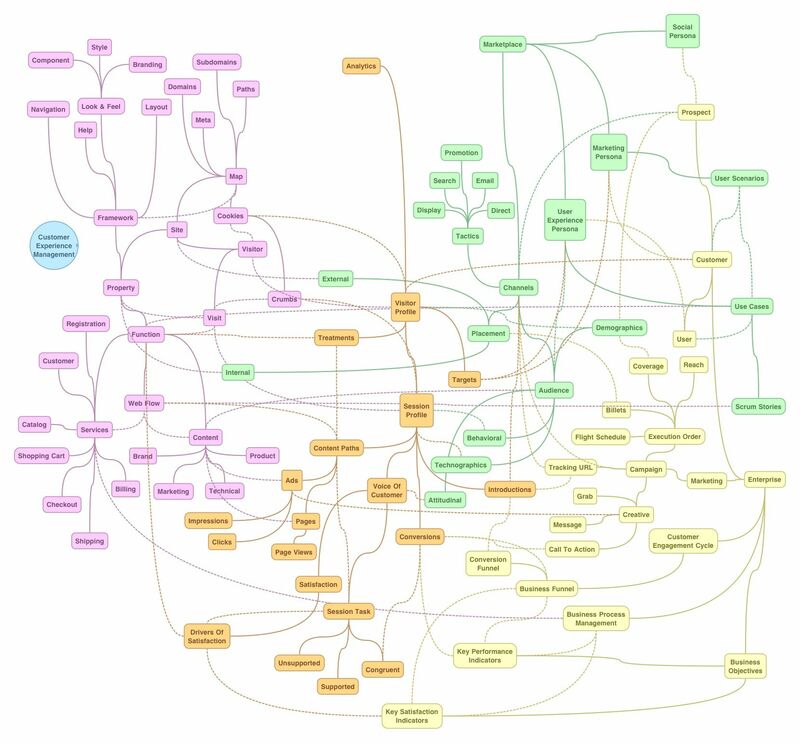 Now building ontologies may not be your forte but this should provide a start on how you can organize your thoughts in a more consistent manner. I have been doing these for years but seldom pull them out for discussion. Their primary purpose is to make sure when talking with various disciplines and domain experts that the discussion doesn’t get diverted into cross semantics or terms being overloaded with different definitions, such as the term – segments. The infectious part of the approach is that as you explore the informal relationships in the graph, new concepts and ideas present themselves to extent the model. For example, how many different marketing tactics are there and how are they similar and different. When working with all the business units at Yahoo, this helped to demonstrate that the various marketing channels – search, display, directory, comparison, affiliate, domain, behavior and contextual could be covered by the same semantic structure though the terms and sometimes processes in each were different. So this understanding is imperative to anyone attempting to integrate multi-channel and multi-tactic efforts. 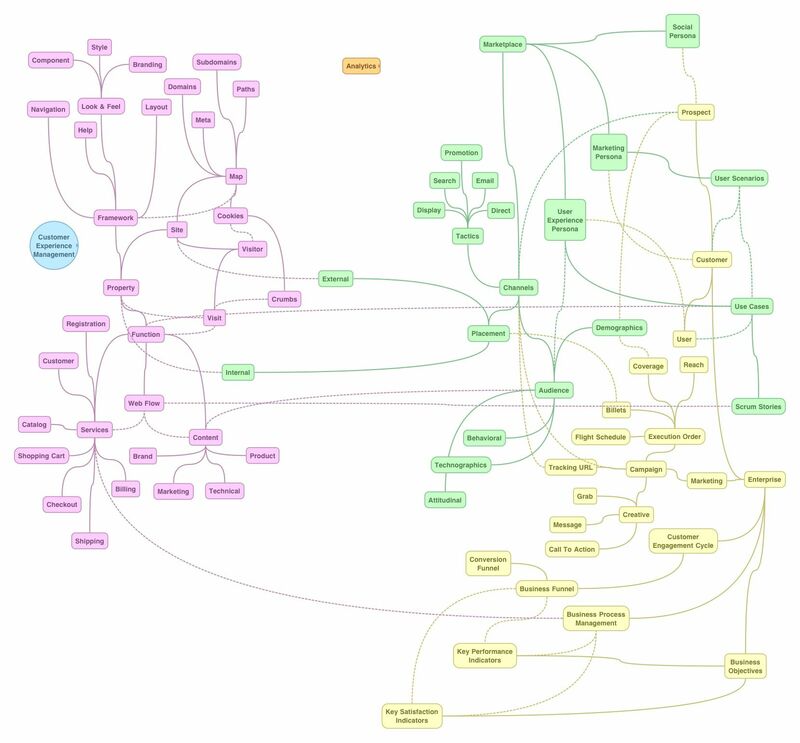 It could be useful to formalize these models into full ontologies that could be accessible via the semantic web. My proposal is for those who would be interested in either participating in developing or reviewing proposed ontologies, please contact me in the comments below or by email, and will try to organize this effort as a measure community project. 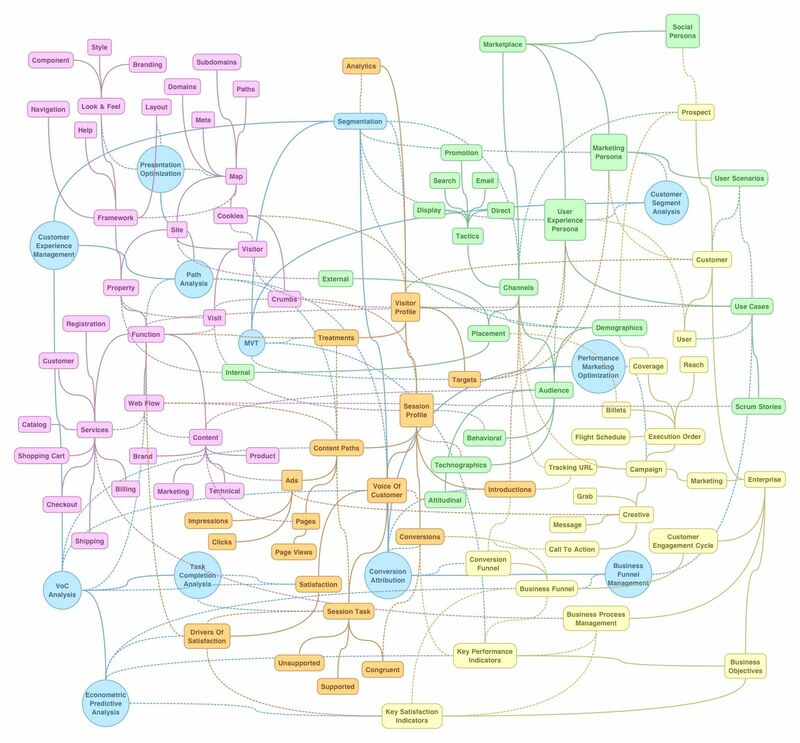 Do not be concerned if you are not familiar with ontologies, this project is primarily for identifying concepts and relationships in analytics. Everybody has something to say about that. This entry was posted in Methodology, Web Analytics and tagged business funnels, conversion, conversion funnels, Coremetrics, customer experience management, ForeSee Results, Google Analytics, KPI, KSI, Omniture, Ontology, RDF, Segments, Semantic Web, Voice of Customer. Bookmark the permalink.